So having read about bokeh, what it is and how it is done I decided to have a go myself, now this can be done in images simply by using a very shallow depth of field when there are areas of high contrast in the background. So the light coming through the canopy of trees for example would work. 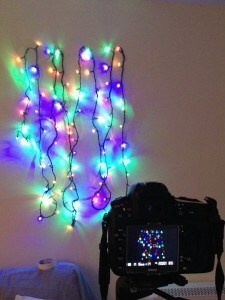 But to really play around with it, the use of lights is a good idea as they are bright compared to most things. Fairy lights are going to be your best bet as they give you lots of individual lights, which can create a pretty cool effect. 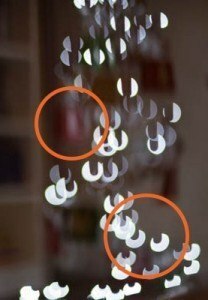 Now one thing with bokeh is the ability to change the shape of the bokeh circles. This is ridiculously clever and it still impresses me that it works and is so simple. You can pretty much create any shape you like. You can if you look hard enough find some stencil shapes that will fit onto the end of your lens. They are laser printed and so come out very accurate. If like me, and most others, you would rather not spend money on something you wont use very often you can just make one your self. This is where you need to pretend you are watching Blue Peter because I am about to say here’s one I made earlier. So here’s one I made earlier!! Okay so this looks like its being held together with sticky tape, which it kind of is, I used the very useful craft tool that my mother has loads of, a craft punch. So with these little gems it makes it easier to create the shapes you want. The issue is that the shape needs to be pretty small otherwise it just won’t work and these cutters will create a very neat shape that is small. You can of course cut out a shape yourself but you need to be very neat and careful with what you create. Any imperfections will show up in your work, as you will see a bit later on. The shape needs to be in the center of the lens to ensure that all the bokeh are the same shape and look even in shape and size, Unfortunately there is a downside to using the craft cutter, they don’t reach very far into the bit of paper so the whole you will cut out will end up being pretty shallow into the paper and this can cause an issue. You need the shape in the middle so you will need to cut out the shape and then add it to another bit of paper. So it’s a little fiddly but a little more creative and fun compared to just buying the stencil. Gives a greater sense of achievement I feel :). So now you have your stencil sorted you will need to sort the lights out. 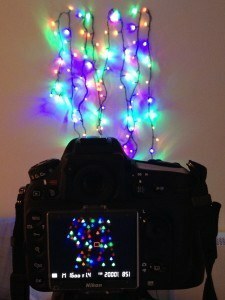 Now you can just point your camera towards a Christmas tree of light (of course this is only helpful if its actually Christmas, little weird to have a Christmas tree in July!) This is how I started, though it’s not an actual tree. So this is simply my camera, pointing towards the lights with the aperture down to as low/as wide as it can go. It was set at f/1.4, really you need to have an f number of 2.8 or lower for this effect to work well. 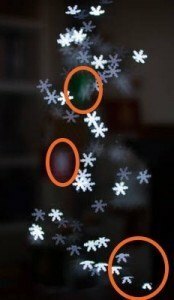 If you point the camera at the lights and change the aperture you can see how the bokeh get small the higher the f/number goes. 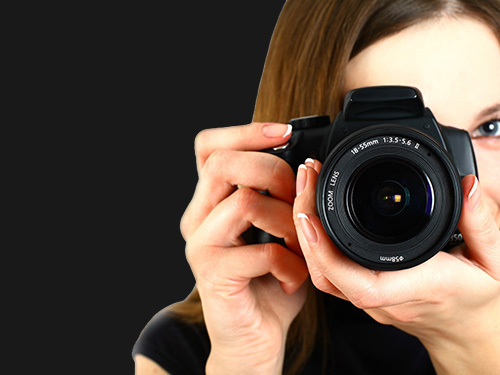 You need to make your camera out of focus as well, this it better if you have manual so that you can sort it yourself. If you don’t have one then you will need to focus on something close to you, keep the button half pressed and then frame the shot. As you can see with this shot there is quite a bit of rubbish in the background, which kind of ruins the image. 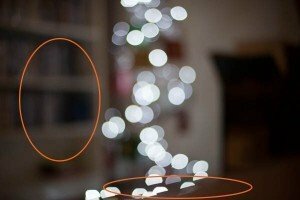 I am pretty intrigued by this technique and how having something very close to the lens affects the shape of the bokeh. So I did that childish thing of sticking my finger in front of the lens to see if that would actually work. Surprisingly it did. As you can see there is a very weird shape affecting the circles causing them to lose their circular shape. 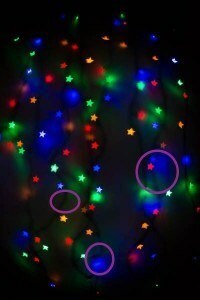 You can also see how the top bokeh are affected more than the ones towards the bottom. This is due to the angle of the shot, the camera and the lights which all effect and influence the shape. So when you put a shape over the lens like the card on the front of the camera earlier. With the stencil in place it really alters the image. When the stencil is over the lens it obviously blocks a lot of the light out so there is no need to be in pitch black to create these images. 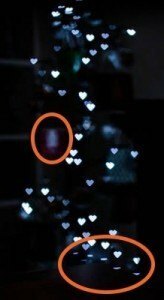 It will cause a lot less light to hit the sensor, this heart image shows you that, it was taken at a slower shutter speed than the first image with a slightly higher aperture but it still appears darker. But the bokeh does takes the shape of the hole, which is a heart. It’s so simple and effective and you really can do any shape you like. If the lens is not completely covered other than the stencil you are wanting, you will find that you will get areas of the bokeh not conforming to your stencil as you can see in this images. 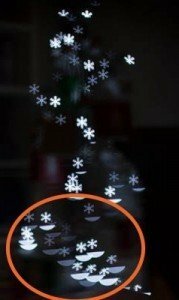 You can see with this image of a snowflake that some of the images are not complete with bits missing which is again due to the angle of the shot so I wanted to try and arrange the shot better. To do this I arranged the lights on a wall, so using a bit of masking tape (as it is a little less damaging) and a well-placed chair I got the lights up on the wall. As you can see the lights are set so that the cover a good area of the wall and I have changed to some multi-coloured lights for something a little different. 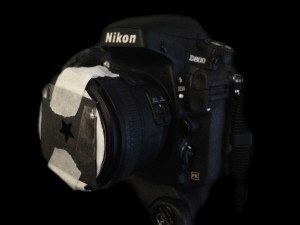 I have also made sure that the lens stencil hood is attached better to help remove the silly errors. The camera is all set up and ready to go with a Christmas tree shaped stencil in place. This is the view I got from behind the camera. You can see the settings used were 1/16000sec shutter speed. F/1.4 for aperture and for some silly reason my ISO is up at 2000, I could have had my ISO at 400 which is the normal setting for a camera which would have made my shutter speed slower. Shooting with a shutter speed this high however means I could have easily handheld the shot. You can see quite nicely in this image how to the naked eye the lights are just bright lights but with the stencil in place it changes them so that the camera sees them out of focus lights as Christmas tree shapes. In this image you get a closer look at what it is you see through the camera. I think it is just crazy how you can see this shape in the bokeh, something I would be really interested to try is having a subject in front of the lights but still have a stencil on the lens, how would affect the subject? Why don’t you give it a go? You can see in this image that though having the stencil over your lens does affect the exposure you still need to be aware of you settings. Although the bokeh has worked in this image you can still see the wires on the wall. At f/1.8 with a 1/800th secs shutter speed the image is a little bright. Though I really love the stars, they work well. 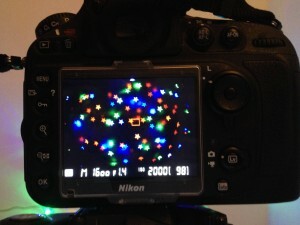 Here it has worked better the setting are the same apart for the shutter speed which is now at 1/1600th secs this makes the images exposure lower leaving you with just the stars on a black background. 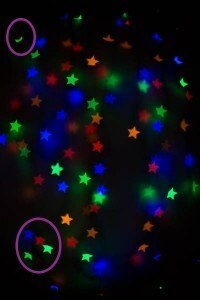 There are a few stars that are not complete, this is likely to happen to the edges of the image but it is a lot better than before than the missing shapes before. This is such a simple technique and easy to try at home with very little expense. There is so much scope for what you can do as well, just think of all the different shapes you could incorporate into an image or simple use as a background to something else?